Tweet In a world of growing complexity, the relationship between technology and sustainability is a pressing issue of concern at the highest levels. There are countless books, articles, tv shows focused on sustainability, but what consumers need to know is that it all starts at a small scale, it starts with us, It all starts at home, one person at a time, one household at a time. The idea of sustainability, or ecological design, is to ensure that our actions and decisions today do not inhibit the opportunities of future generations. Small lifestyle changes can lead to big benefits for the environment. One of the design trends for 2010 is Home Design Style with a Conscience - it's all about eco-friendly design, products and implementation. There are many design concepts for products that will help us pay more attention to how much water and electricity we spend. One design concept is an Energy-efficient refrigerator concept. A refrigerator that saves energy by minimizing the outflow of cool air. When you open the refrigerator door, warm air flows in and cool air flows out therefore an increase use of electrical power. Korean designer Kim Yong-jin figured out a way to prevent the outflow of a considerable amount of cool air, go to his website, click on “shift” from the top menu. Another cool project by the same designer is “switch”. Standby power refers to electrical power wasted by electronic appliances that are connected to power but not in use. Did you know that standby power represents 11% of total household electricity consumption?? But plugs are not easily disconnected from the socket, so they are just left connected plus once you disconnect them they are in the way and they pose a risk for electrical shock accidents. The solution in concept is a switch that simply be turned instead of being unplugged. Switch- why hardly unplug? Just twist it easily- go to his website and click on "switch" from the top menu. One other example is this Bathroom Mirror that shows Water Consumption in LEDs As You Wash Your Face. 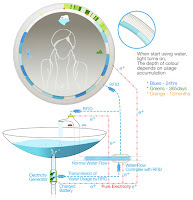 This is just a concept design by designer Jin Kim for a bathroom mirror that monitors your water spending behaviour. More than that there is a control in the mirror so your supply is limited once you use too much water. Designed to be a part of your home this intelligent mirror shows you the amount of water you use on the daily, monthly, and yearly basis. Blue color is for 24 hrs usage; green for 365 days and orange is for 12 months. There are LED colored lights on the rims of the mirror and each color represents the amount of water that runs through the sink to which the mirror is attached. But at the end of the day, whether you live in a condo or a house, it’s up to all of us to be more conscious about what we do and how we try to save the planet, one step at a time, one person at a time. Ecosystems, consciousness and sustainability are definitely interconnected.